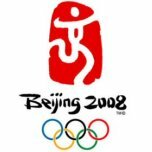 The Beijing Olympics begin tomorrow, and I can’t help but feel a surge of anticipation. I have religiously watched every Olympic Games – both Summer and Winter – for as long as I can remember. Perhaps it’s because there is something compelling about witnessing people giving their absolute all, not holding back any reserves and pushing themselves to their utmost because there may never be another chance to shine so brightly. Perhaps it’s because it represents a chance to discover more about countries which are rarely in the news; for example, few people in Britain or America spared a thought for the South American nation of Surinam until Anthony Nesty won the gold in the 100m butterfly in 1988. And who can forget “Eric the Eel”, the swimmer from Equatorial Guinea who competed, albeit thoroughly unsuccessfully, in 2004? Over time, I’ve learned that each Olympic Games can be summarised in a single word. The word for Barcelona’s games in 1992 was “hot”; I don’t believe I spotted a single athlete that didn’t look like they were struggling with the heat. Atlanta 1996 can be summarised as “tacky”: from the awful Smurf-blue “Whatizzit” mascot to the prevalence of corporate sponsorship, it was the epitome of bad taste. Sydney 2000, my favourite Games so far, was “fun”; the Australians are a bright and enthusiastic people, and this spirit was abundantly in evidence. Athens 2004 was “traditional”; after all, the Games had returned “home”. It may be a bit early, but it appears Beijing 2008 already has found its moniker: “paranoid”. I am not referring solely to their concerns about terrorism and heavy handed police presence, though that certainly is a factor. Nor am I speaking just about how they treat pro-Tibet protesters, though that is a major issue; the Chinese attempts to confine protest to a small “complaints” hut have been laughable. No, the label extends from their apparent terror of embarrassment, driven by a need to be “seen as perfect”. China wants these Games to be its “coming out” party, whereby it proves that it is more organised, efficient, modern and civilised than any other nation. A good example of this paranoia at work is how the Chinese are addressing concerns about pollution. According to the Guardian newspaper, pollution levels in Beijing yesterday were at twice the level recommended by the World Health Organisation. However, officials said it was not smog, merely a “mist”. This act isn’t fooling anyone; one of the greatest marathon runners of all time, Haile Gebrselassie of Ethiopia, will not be participating in the event at Beijing because of its pollution levels. Furthermore, the Chinese are making strenuous efforts to get rid of the “mist”; it was reported yesterday in the London Evening Standard that they are firing “anti-smog pellets” into the air. The problem was also in evidence, albeit differently, at the sailing venue; in late June, it was noticed that blue-green algae were growing rampantly in the waters near Qingdao. The government mobilised the public and the army to physically remove the persistent plants, whose growth had been spurred by the waste toxins pumped out by Chinese industry. I must admit that this is the first time I’ve seen preparations for an Olympic games which involved soldiers wading into stagnant pools and lifting out armloads of rotting vegetation. Another symptom of Chinese anxiety is visible in their latter day attempts at what can generously be called “urban planning”. In order to ensure that Beijing was looking at its best, shops and “slums” have been demolished. Migrants and the homeless have been similarly “moved on”. The BBC recently showed the hapless owner of a small corrugated iron sweetshop who had been summarily told that her business was an “eyesore” and was to be demolished. The Chinese government says that those who have been “inconvenienced” have been compensated or moved to better surroundings, but this claim deserves to be treated with the same skepticism that accompanies their claims to respect the Tibetians or Uighurs culture and religion. A further indication of Beijing’s apprehension can be discerned in the behaviour of foreign leaders. President Bush has denounced the Chinese record on human rights, but he did it in Thailand, and said that any change in China would be in accordance with their “traditions”. It is mildly laughable that President Bush, the “founding father” of Guantanamo, would feel morally capable of lecturing the Chinese on the basis of ethics; that said, it is a symptom of both weakness and duress that Bush felt that he couldn’t voice his hypocritical concerns directly. China, after all, is one of the biggest purchasers of American debt; Bush’s deficits are being run up on a Chinese credit card. Similar pressure has likely been applied to Gordon Brown, President Sarkozy and others: as a result, no world leader is boycotting the Games due to human rights concerns. None of them have forcefully mentioned the plight of the Uighur minority, for example: it is a nation that was independent twice, only to have that independence twice ripped from them, and is now being slowly strangled by government repression and by Han Chinese immigration. No doubt that a message has been sent to the chancelleries and departments of state around the world, which simply says, “shut up”. Finally, we have evidence from one of the oldest crutches of authoritarian rule: overpowering architecture. The chairman of London’s Olympic committee, Paul Deighton, summarised the scale of this endeavour best: “I think the Beijing Games could end up being unique – I’m not sure how many other countries would have either the resources or the control of the resources to be able to put them behind an event like this.” Among the venues that the Chinese have constructed is the giant “bird’s nest” National Stadium, a swimming venue called the “Water Cube”, which looks like a huge box of soap bubbles, and the Beijing University of Technology Stadium, which possesses the “world’s largest pre-stressed dome”. All the madness, all the hauteur, all the puffing up and thrusting forward will serve something of a purpose: no doubt the Chinese are going out of their way to try and make matters convenient for the athletes and guests. However, it is rather like trying to have fun as organised by a German drill sergeant: there is an air of “you will enjoy yourself now!” which implies that the charm of previous Games may elude it. One can only hope that this Olympics, like others provided by questionable regimes, will perform its old magic trick of rising above the constraints of its surroundings: after all, even the dreadful Olympics of 1936 was susceptible to being elevated in tone and majesty thanks to Jesse Owens. I will be tuning in, crossing my fingers, continuing in my efforts to purchase a “Free East Turkestan” (home of the Uighurs) t-shirt and hoping for the best.